A Godly new Ballad, Intituled, A Douzen of Points. Whereon each Christian Soul may feed. Thy Life more pure and just will be. Of all your sins and wickedness. That hath defended thee all night. For to preserve thee night and day. Then God will bless thee to be sure. Take heed I say, and do not so. So God will bless thee to the end. And bring thy soul unto decay. The eye of Justice so to blind. And to thy Country bear a faithful heart. And knit them fast then credit me. Date Published: 1685. It was found in Pepys Collection of Ballads, 2.30. located in The Samuel Pepys Library, Magdalene College, University of Cambridge, Cambridge, England. This is not the sort of ballad or carol that we usually associate with Christmas, but it does point out an important part of the Advent preparations of our ancestors: proper preparation of the soul for the Second Advent (the Second Coming at which time all will be judged). 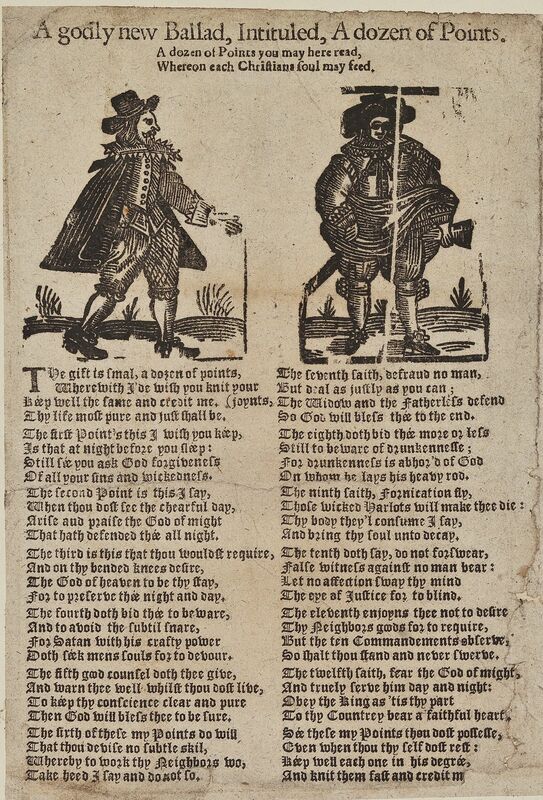 Other Christmas Broadsides contain ballads with similar themes of personal preparation. It is available online at the English Broadside Ballad Archive, University of California, Santa Barbara, (EBBA ID 20653). 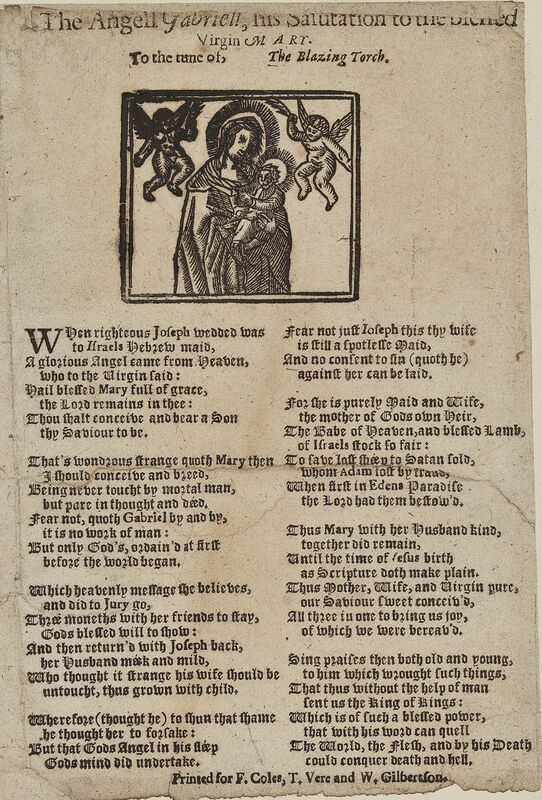 Printed on same sheet with this ballad was one entitled "The Angel Gabriel, his Salutation to the Virgin Mary," also found under the title of When Righteous Joseph wedded was. 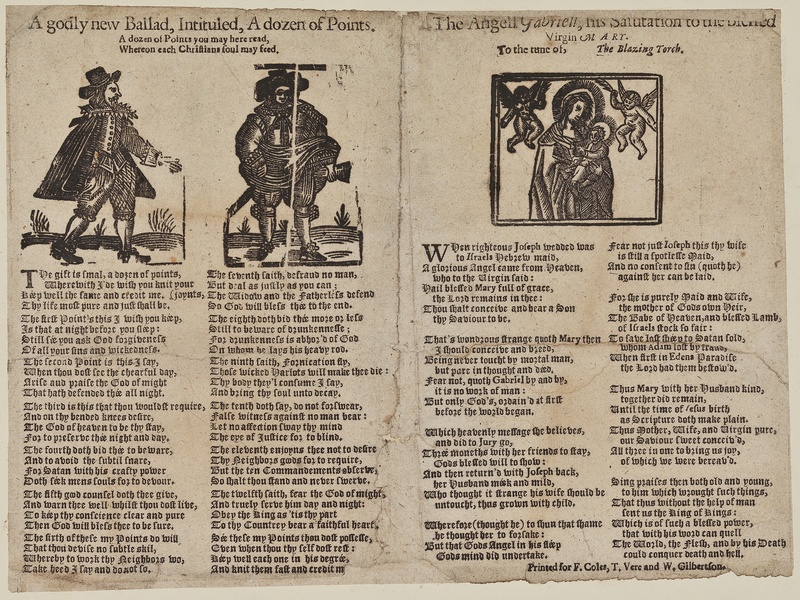 Compare: A Dozen of Points; the companion ballad on that Broadside was When righteous Joseph wedded was (from the Euing Collection).